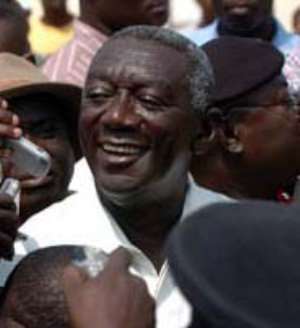 ...Ghanaians abroad to vote next time Accra, Dec.10, GNA- President John Agyekum Kufuor on Friday dismissed claims that the Government intended to increase the price of petroleum prices from February 15, saying "it is sensitive and responsive to the needs of Ghanaians". "The Government is sensitive, very responsive and caring to the needs of Ghanaians and would not take any unnecessarily harsh decisions to deepen their plight," he said. President Kufuor was answering questions from journalists after a 10-minute victory address, dedicated to those who contributed to his success, at a news conference held at his Airport residence in Accra. A journalist had sought to verify an allegation of planned increases in prices of fuel products from February 15. President Kufuor said the Government had managed the economy with the unprecedented increases in crude oil prices, stressing it had not overburdened the Ghanaian in the process. He said the price of crude oil on the world market was falling and was hopeful that in February next year increases in fuel prices would not be a problem. In an answer to a question on enfranchising Ghanaians abroad to vote, President Kufuor said the process was underway and expressed the hope that the introduction the identity card system would next year facilitate, the process. He said with the dual citizenship and the ID system there would be easy identification and authentication of Ghanaians anywhere on the globe. President Kufuor said the Government had learnt a lot of useful lessons from the elections, which showed that democracy was being deepened in Ghana and power actually resided with the people. The EC on Thursday declared President Kufuor winner of the Presidential Election held on Tuesday with 52.75 per cent of the votes cast. President Kufuor said his re-election demonstrated the nation's commitment to democratic governance and its acceptance of the NPP Government's policies and programmes. "Chapter Two of Positive Change would be more productive and be eventful and prosperous for our country," he said. A large number of Ministers of State, including those who lost the parliamentary contest, party supporters, family members and well-wishers were at the President's residence to participate in the victory festivity. Others, mostly the youth gathered outside the house and cheered and danced in celebration. Both the President and the Vice President acknowledged and thanked them for their laudable support. Prof. Mills of the main opposition National Democratic Congress (NDC) obtained 44.32 per cent of the total votes cast; Dr Edward Mahama of the People's National Convention (PNC) had 1.93 per cent while Mr George Aggudey of Convention People's Party (CPP) got one per cent of the votes. President Kufuor needed 50 per cent plus one of the total votes cast to win in accordance with the Constitution of Ghana. The results were from 225 out of the 230 constituencies in the country. In absolute terms, President Kufuor obtained 4,463,731 votes while Prof Mills got 3,750,830; Dr Mahama 163,648 and Mr Aggudey had 84,501 of the votes. Dr Kwadwo Afari-Gyan, Chairman of the EC, announced that 8,615,306 votes were cast, while 183,997 ballots representing 2.14 per cent were rejected. The total valid votes cast were 8,462,710. The voter turn out was 83.2 per cent. Ghana leader vows war on poverty BBC-- Mr Kufuor promised voters that prices and wages will improve Ghana's President John Kufuor has pledged to focus his next four years in office on tackling poverty. Mr Kufuor told the BBC his priority was to improve the lives of 40% of the population living without access to clean water, sanitation or employment. The president, who was re-elected on Tuesday, said he believed the key to stability in Africa was ensuring that no part of society was marginalised. And he valued the opposition, as long as it worked within the law. President Kufuor was returned to office after securing nearly 53% of the vote in Tuesday's election, which was praised by election observers. In an interview with the BBC, Mr Kufuor stressed that poverty was a legacy of the failure by successive governments to address the problem. "My government is determined to reduce the deprivation as much as we can within the term of four years," he said. John Kufuor During his first term, the president cut inflation and borrowing costs, and he assured people during the election campaign that prices and wages would improve. Mr Kufuor expressed his willingness to work with the political opposition within the boundaries of the constitution. "I lived in opposition for around 30 years, so in a way I empathise with the opposition. I will respect it," he said. He attributed the fair and peaceful elections to a desire of voters for stability. He said: "People seem to feel they have had enough of experimentation since independence 47 years ago. "We have seen about three or four military regimes...and these have not served the aspirations of the people."